Made with hot water crust pastry, this delicious vegetarian alternative to a game pie, is sure to satisfy even the most carnivorous diner! Week seven of the GBBO series was Victorian Week, another first for the Bake Off. I had no real appreciation that the Victorians used sooo much gelatine in their baking, it was everywhere! The bakers this week were challenged with making a Raised Game Pie, a Technical Bake of Tennis Cake and a Show Stopper of Charlotte Russe. So although the Charlotte Russe appeals immensely to me, I’d want a vegetarian friendly so my beloved Mr E can sample it (I may have a play around another day to see what I can come up with). The fruit cake looked nice too, but given that I have a couple of rich fruit cakes to make in the very near future Mr E & I decided to make a Raised Game Pie. 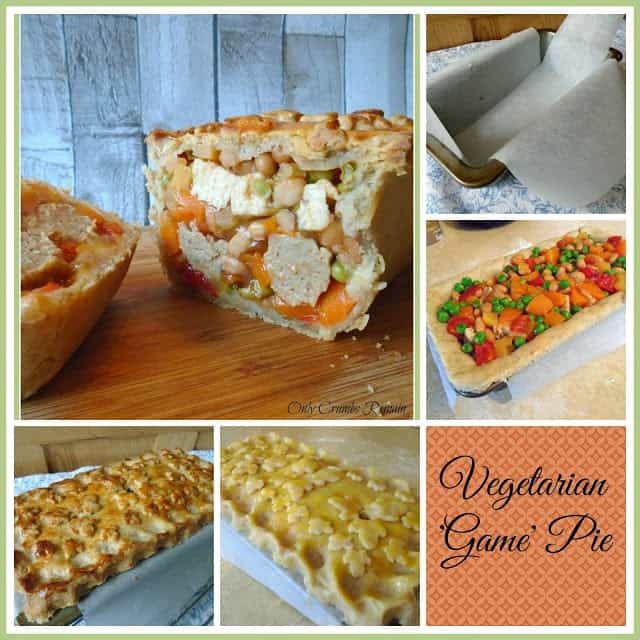 Okay, let’s clarify this, we were inspired by the raised game pie; I’m not going to make a pie filled with rabbit and boar and the likes for my vegetarian hubby to eat, now that would be mean! And to be honest, I really wouldn’t fancy eating that either. We do enjoy pastry and hot water crust is particularly delicious. 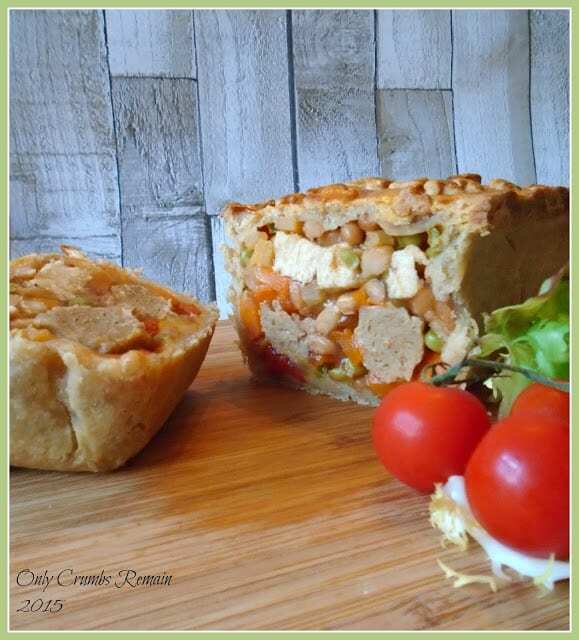 So we popped our thinking caps on and decided to use two different quorn ‘meats’ in our pie alongside a medley of vegetables. I included ‘chicken’ pieces and Swedish style ‘Meat Balls’, both being very different to each other. The meat balls have a slight spice to them and are a less compact ‘meat’. Rather than blend everything together, I decided to layer everything up in the pie mould; it looked rather nice once the pie was sliced in to allowing you to see the distinctive layers of ‘meats’. I then made a vegetarian jelly which was poured into the pie through the steam holes; I felt this was necessary in order to hold the pie together when it was sliced and it also added some extra flavour. I decorated the top of the pie with an ivy leaf pattern created from a dough cutter, though to be honest the shape actually looks more like fleur de lis , which is perhaps more in keeping with the Victorians anyway! I have made hot water crust pastry twice before, it’s really quite different to other pastries which need to be kept cool. The pastry does need to be worked with quickly, as Paul explained the pastry can crumble if it is allowed to cool before you’ve finished moulding it. 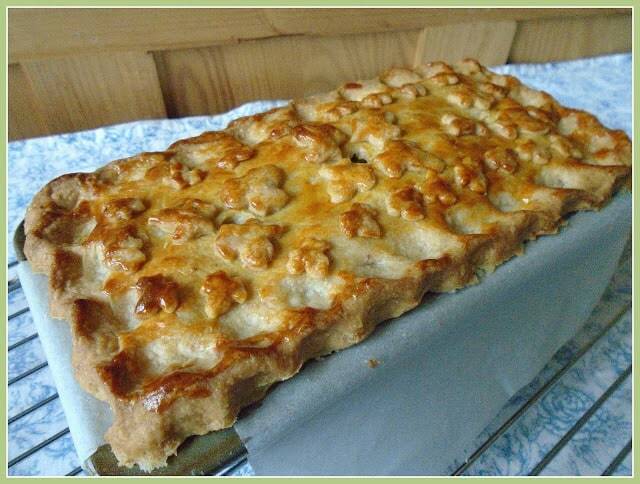 So if you make this pastry, just pray nobody pops around for a pot of tea and a natter whilst you’re elbow deep in it! And the verdict? It was delicious, though I think I will leave it in the oven for a little longer next time for the pastry sides to bake a little more, (I’ve reflected this in the recipe details below). This said, my parents and Mr E & I thoroughly enjoyed it. There was a clear distinction with the two different types of quorn used and a subtle spice coming through from the ‘meat balls’. Also, the small amount of wholemeal flour which I added to the pastry was a nice addition. Time: about 40 minutes hands on time, plus 85 – 90 minutes baking time, and cooling time. 1 egg yolk, beaten to glaze. 1. Prepare the filling. Cook the carrots & swede in a pan of water or in a steamer until almost tender. Half cook the frozen peas as per the packet instructions, strain. Place the cooked vegetables in a good sized bowl & set aside to cool. 2. Meanwhile, char the pepper. Using a cook’s blowtorch or gas flame on the hob, char the pepper. Please be careful doing this. Once charred, wrap the pepper in cling-film. When cooled unwrap the pepper and peel off the chargrilled skin, rinse under a running tap. De-seed the pepper and chop the flesh. Add to the bowl of cooked vegetables and mix again. Allow the filling to cool. 3. Prepare the beans. Strain the baked beans from their tomato sauce, reserving the sauce in a Pyrex jug to make the jelly filling later. Place the beans with the other vegetables. Mix together, add the seasoning and the leaves from the two stems of thyme. Mix again. 4. Cook the Quorn ‘meat’. Place a little oil into a frying pan, heat over a gentle flame and cook your ‘chicken’ pieces for about 12 – 15 minutes until nicely coloured. Place into another bowl to cool. Cook the Quorn Swedish style ‘meat balls’ in the same way until nicely brown, turning regularly. Place with the ‘chicken’ pieces to cool. 5. Pre-heat the oven to 200c / 180 Fan / Gas 6. 6. Prepare your loaf tin. Using 2 strips of greaseproof paper line your loaf tin. One strip of paper will need to be narrow (approx. 9cm) to line the length of the tin and come up the sides, the other will need to be wider (approx. 18cm) to cover the 2 other sides (see image above). The base of the tin will now have a double layer of greaseproof paper. Do ensure the paper extends beyond the rim of the tin as this will help you to remove the pie once it has been baked and cooled. 7. Make the pastry. NB Only start the pastry once you are sure you have time; you need to work quickly at this stage, as once the pastry cools it starts to crack and can’t be moulded. Place the flours and chilled, diced, butter into a good sized bowl. Rub the fat into the flour with your thumb and finger tips until it almost resembles bread crumbs. Make a well in the centre of the flour mixture. Place the Trex, water and salt into a small pan. Sit this on a gentle heat to slowly melt the fat, then increase the heat to bring the water to the boil. Pour most of the liquid into the well and stir together with a wooden spoon to make a dough, add more of the hot liquid if required. Knead the dough on a lightly floured work surface for 1 – 2 minutes. 8. Line the loaf tin. Break off 1/3 of the pastry and wrap in cling film to keep warm. On a lightly floured work surface, roll out the larger piece of dough into an oblong to line your tin. Fold the pastry over the rolling pin, and using the pin lift the pastry over the tin and lower it in. Using your thumb and fingers, carefully ease the pastry into the edges, moulding it to neaten the sides. Patch any tears which appear in the pastry. 9. Fill the loaf tin with the filling. Place a layer of the vegetable mixture into the base of the loaf tin. Top with the meat balls laying them side by side in 4 pairs. Add some more vegetables, easing them around the meat balls. Top the vegetables with a layer of ‘chicken’ pieces. Finish with a final layer of vegetables. Gently compact the mixture a little in the tin. With a pastry brush paint the edges of the pastry with the beaten egg yolk ready for the lid to sit on, this will act as a glue. 10. Roll out the lid. Unwrap the reserved piece of pastry and roll out into an oblong shape on a lightly floured surface. Fold the pastry over the rolling pin, use the pin to lift the pastry and lay it over the pie. Press the edges to seal. 11. Trim & crimp the pastry edges. Using a sharp knife, trim the excess pastry from the tin and set it aside. Using your thumb and two forefingers, crimp the edge of the pastry to make a nice edge. 12. Cut air holes in the lid. Using the point of a sharp knife, cut out 3 circles from the pastry lid, these will allow the steam to escape. 13. Decorate the pastry lid. With the excess pastry, create pastry shapes to adorn the lid. These may be flowers, leaves, braids etc. I used an ivy leaf cutter to make a simple pattern. Paint the top of the pastry lid with the egg yolk and add your pastry embellishments. Paint the embellishments carefully with the remaining egg yolk. 14. Bake. Place the pie in the centre of the oven for 30 minutes. Rotate the pie if necessary. Reduce the oven temperature at this point to 180c / Fan 160 / Gas 4 and bake for a further 55 – 60 minutes until the pastry is cooked through. 15. Cool. Once the pie is cooked through, remove from the oven and place on a wire rack to start cooling. 16. Make your stock. As soon as the pie has been removed from the oven mix 1/2 pint of cold water with the tomato sauce reserved from the baked beans and a vegetable oxo cube. Dissolve the vegetarian gelling agent in this and continue to make as per the gelling agent instructions. 17. Once your stock is made, use either a funnel or measuring jug with a spout, very carefully pour your stock into the pie through the 3 steam holes in the lid. Do this slowly. Allow it to settle adding more if necessary. You probably won’t need all of the jelly. 18. Finish cooling. Set the pie aside to completely cool and the jelly to set before serving. Use the greaseproof paper ‘handles’ to remove the pie from the loaf tin. 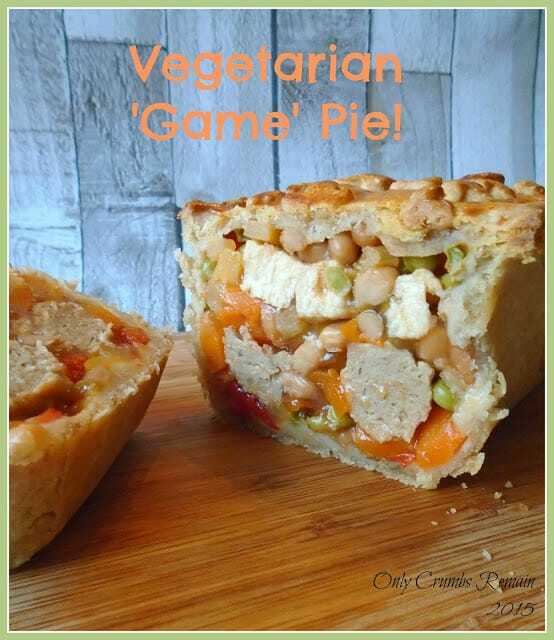 It's great way to share in classic or traditional baking and/or cooking with a vegetarian 'game' pie! Thank you for sharing this recipe with us on #thepastrychallenge! You and me both Camilia! I fancied making the Charlotte Russe as well but haven't attempted it yet because I need to be able to make a bavois without pig's gelatine (vege-gelatine works so differently)!! Thank you, it was really delicious Kirsty. 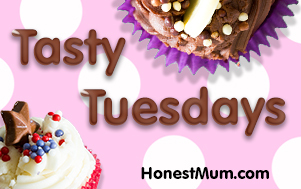 Thanks Sarah, hot water crust is just amazingly scrummy isn't it! As a child I'd eat the pork pie pastry case, leaving the filling for my dad as that pastry was undoubtedly the best part! Thank you Alison, I think the pastry needed a smidge longer in the oven for the base & sides to cook a little longer. Do try hot water crust when you get chance, it's not difficult as you clearly don't need to worry about keeping it chilled like the other pastries! This looks so tasty, and I love the pastry details too! Thank you Lucy, it was really yummy! We shared it with my parents and there wasn't any to be saved for the following day after my dad and Mr E dived in for seconds! Aw thank you Cathy x. It's really tasty and I don't think my mum and dad (who aren't vegetarian) missed the meat. This is so clever, I will try it. For this week's challenge I'll make (today, didn't have time until now) fruit cake and charlotte russe (vegetarian, as I am). I like it a lot, is so clever. Ooh I'll keep an eye out for your vegetarian Charlotte Russe. Thank you Rebecca. For hubby & I, eating as vegetarians, it seemed the natural choice, and as Quorn has so many different products that are different to one another in flavour it was quite easy to make definitive layers in the pie in a similar way that a meat pie might have. Woah that is incredible! What a mega pie, love the golden crust – divine! Thank you Jessica 🙂 It's amazing what a nice egg wash does for the top of a pie isn't it?! Wow! That's an impressive pie. So tempted to go back now and try a hot water pastry! I can believe everyone enjoyed it, it looks delicious and such a great structure. Aw thank you Debbie 🙂 Yes, when you get chance, do try hot water crust pastry it's delicious!